Moeraki is a small fishing village on the east coast of the South Island of New Zealand. It was once the location of a whaling station. In the 1870s, local interests believed it could become the main port for the north Otago area and a railway line, the Moeraki Branch, was built to the settlement and opened in 1877. However, the port could not compete with Oamaru and the lack of traffic as well as stability problems caused by difficult terrain led to the closure of the railway in 1879 after only two years of operation. The village is best known for the nearby Moeraki Boulders. 'Moeraki' is usually translated as 'sleepy sky'. There are other places with the same name or versions of it, all along the path from the Polynesian homeland, Hawaiki. The south side of the Moeraki Peninsula has an Archaic (moa hunter) Māori site at Waimataitai lagoon, which Atholl Anderson dated as 13th century, placing it in the second wave of New Zealand's early human occupation. Gavin McLean tentatively linked its occupants to Waitaha, conventionally the third iwi, or tribe, to arrive in southern New Zealand, after Kahui Tipua and Te Rapuwai. Waitaha's expedition leader was Rakaihautu. However, as McLean notes, 'Waitaha' is also a name simply used to designate all the peoples preceding Kati Mamoe and Kai Tahu ('Ngāti Mamoe' and 'Ngāi Tahu' in modern standard Māori) the last two arrivals before the European. It is safe to say Waimatatai is a 'Waitaha' site in that broad sense but there are no specific families it can be linked to. 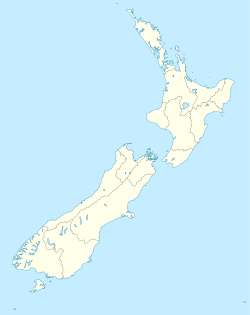 The Moeraki peninsula terminates to the south in Kartigi Point ('Katiki' in modern standard Māori) where there was a pā (fortified settlement) of the Classic period of Māori culture. Its traditional name was Te Raka-a-hineatua. According to tradition it was built by Taoka, a well known fighting chief of the late 17th to early 18th centuries, who also built fortresses at the Ashburton River and near Timaru. Shortly after it was built it was attacked by a party from Kaikoura who were successfully repulsed by Taoka in the battle known as Te Hakopa. Taoka was also in battle with chiefs further south at Huriawa (modern Karitane Peninsula), Mapoutahi (modern Goat Island Peninsula) and Pukekura (modern Taiaroa Head). Taoka's principal opponent was Te Wera. Jill Hamel has reported there were terraces, the best developed of any southern pā, and rectangular houses with stone fireplaces. Radio carbon dating has confirmed it was occupied in the 18th century. It used to be said Moeraki, like many other places on the east coast, was not a site of permanent occupation in pre-European times, but a major study, published in 1996, shows that is unlikely. Moeraki was traversed during the Sealers' War, also known as the War of the Shirt, in 1814. In that year a party of eight men under Robert Brown including two other Europeans and five lascars, or Indian seamen, came up the east coast from Stewart Island/Rakiura looking for a group of lascars who had absconded from the Matilda, Captain Samuel Fowler. According to the Creed manuscript, discovered in 2003, they camped for the night by their boat at 'the Bluff eight miles from Moeraki' to the north. However they were observed and attacked by Māori. Two of the sealers escaped and fled to Bobby's Head and Goodwood, south of Moeraki, taking two days to get there and where they were later killed and eaten. They will have passed Moeraki going north and fleeing south. John Hughes, accompanied by W.I Haberfield and other men from the Weller brothers' Otago whaling station, established a whaling station in Moeraki Bay, Onekakara, on Boxing Day, December 26, 1836. Since that time European occupation has been continuous. When Hughes and his men arrived there were only nine Māori living in the area, under Takatahara. In 1838 a large group arrived under Matiaha Tiramorehu and settled, in close proximity to the whalers. Many of the latter married Māori women. Haberfield later maintained alcohol was absent at Moeraki, in striking contrast to more southerly stations, especially the one at Otago. After 1839 whaling dwindled and ceased by the late 1840s, although there was later a brief revival. Even so, some of the whalers stayed. There were European visitors in the early 1840s. After the Otago Association's settlement based at Dunedin further south in 1848 a Moeraki sheep run was leased by 1852. A 'Hundred' was declared in 1860, opening the area to closer rural settlement. From 1854 Moeraki Bay served as a port for North Otago starting the period of rivalry with the one at Oamaru described above. It was over by 1879. Since then Moeraki has been a fishing village, farming centre and coastal resort. Moeraki Marae is located at Moeraki. It is a marae (meeting ground) of Ngāi Tahu and its Te Rūnanga o Moeraki branch, and includes the Uenuku wharenui. In the late 1890s Frances Hodgkins (1869–1947) who became New Zealand's best regarded expatriate artist, regularly visited Moeraki to paint local Maori. A number of those works are now in the collection of the Dunedin Public Art Gallery, Dunedin. Keri Hulme lived in Moeraki in the 1980s while she wrote her Booker Prize–winning novel 'The Bone People'. Fleur Sullivan, the founder of the well-known Oliver's restaurant in Clyde, Central Otago, moved to Moeraki in the late 1990s and set up her distinctive waterside restaurant 'Fleur's Place'. ^ Malcolm, Jill (24 November 2015). "VISITING MOERAKI AND OTAGO EAST COAST". Motorhomes Caravans & Destinations. Retrieved 17 March 2018. Anderson, A. (1983) When All the Moa-Ovens Grew Cold Dunedin, NZ: Otago Heritage Books. Entwisle, P. (2005) Taka A Vignette Life of William Tucker 1784-1817 Dunedin, NZ: Port Daniel Press. ISBN 0-473-10098-3. Hamel, J. (2001) The Archaeology of Otago Wellington, NZ: Department of Conservation. ISBN 0-478-22016-2. McLean, G. (1986) Moeraki Dunedin, NZ: Otago Heritage Books. ISBN 0-9597723-3-2. Sorrell, Paul & Warman, Graham. (2008) Fleurs Place Auckland, NZ: Penguin. ISBN 9780143008606. This page was last edited on 19 June 2018, at 04:58 (UTC).